Our mission: To bear witness to God’s presence, creative and redeeming work in the world. Support the called Pastor in his work for the Church, the local and larger community. Lead by guiding committees and the congregation in becoming the little Christs we are baptized to be. Lead Church programs and operations by overseeing personnel, committees and activities. Individually act as conduits between congregation members and Council, taking members concerns to the council and communicating council’s plans and decisions to the congregation. Take action on matters of Church mission and life during the Church year as the need arises. Approve the annual Church budget for congregational passage. Provide for the annual audit of all Church finances and financial transactions. With the congregation, we act as greeters of visitors before and after services. We help enable respectful worship by acting as Ushers during worship services. We help the financial secretary as tellers after the services. We attend once monthly Council meetings, usually for less than two hours. We each liaison with a Church committee, become involved in the committee’s work and keep the Church council up to date with those activities. Every member of the congregation should serve on Council at some time. You will have the opportunity to understand how the Church works behind the scenes, offer your unique skills to the work of the Church and serve with your brothers and sisters in bringing God’s word to those who have not yet heard. When someone asks you if you are willing to be a member of council, answer God’s call. We are your new Church Council because we not only have a number of new members, but because this is a new year and a new Council term. A few of us had our three year terms end and a few more of us have joined your Council to start new terms. Each of your Council Members is “Council Person of the Month” for a month during the year. That means that they are the volunteer coordinator for the worship services during their month. Whether you have volunteered to be a Reader, Usher, Acolyte or any of the other worship volunteer positions, they are the person to touch base with when you get to Church on a Sunday morning if you are volunteering. They are also the one to get in touch with when you have found a replacement if you can’t serve on a Sunday that you are scheduled. 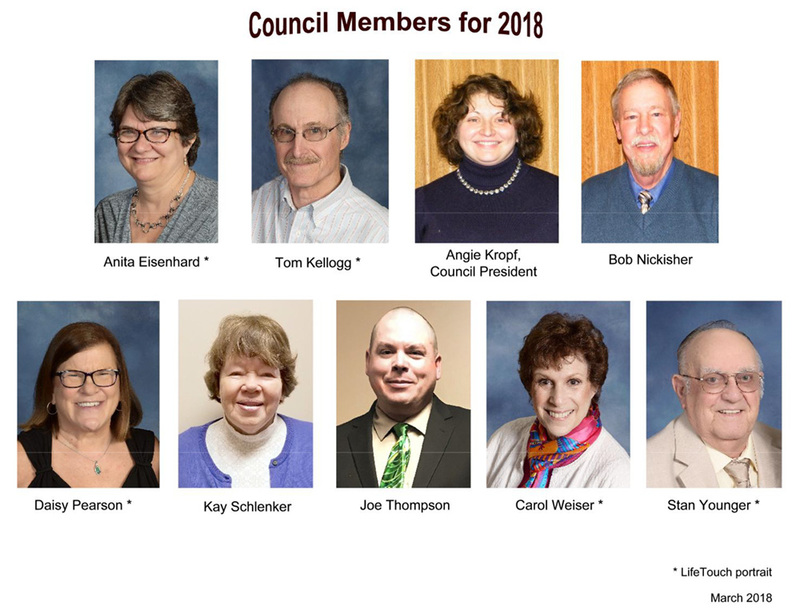 St. Paul’s Lutheran Church Council is YOUR council. We are the “go to” people for you when the need arises, the people with whom your hopes and dreams for St. Paul’s should be communicated. St. Paul’s is a loving, welcoming place. The more we grow in the spirit of love that God has given us through our baptism, the more we can do to fulfill His desire that all come to know Him through His Son. And it is through His Son that we bring his love to our community and the world. May God give the strength, wisdom, love and grace to serve and make it so.